A cat found frozen to the ground Thursday afternoon is back home with his family after widespread media coverage helped them find him. Good Samaritan R.J. Poulter was driving on Route 13 in Old Chatham, New York Thursday afternoon when he noticed a grey mass of fur sticking up through the snow and ice and took the time to investigate. The furry lump turned out to be a cat. R.J. initially thought kitty was dead but he sprang to action when he realized the semi-buried animal was breathing. He literally had to peel the cat off the roadside, where it was stuck frozen to the ice and snow. R.J. turned the cat over to his friends at the Little Brook Farm animal rescue and sanctuary, also located in Old Chatham, where the little survivor was warmed by the fire and revived. It was apparent that the cat was probably someone’s pet. He was a friendly, young, unneutered, well-fed and apparently healthy male. Little Brook Farm staffers took the kitty to the vet on Friday, where it was confirmed that the very lucky boy was in good shape and had been rescued before suffering any serious effects from the cold. We shared the story on Friday in our post Good Samaritan rescues cat found frozen to the ground. The story also got considerable local news coverage, and made it to a national TV program, as well. 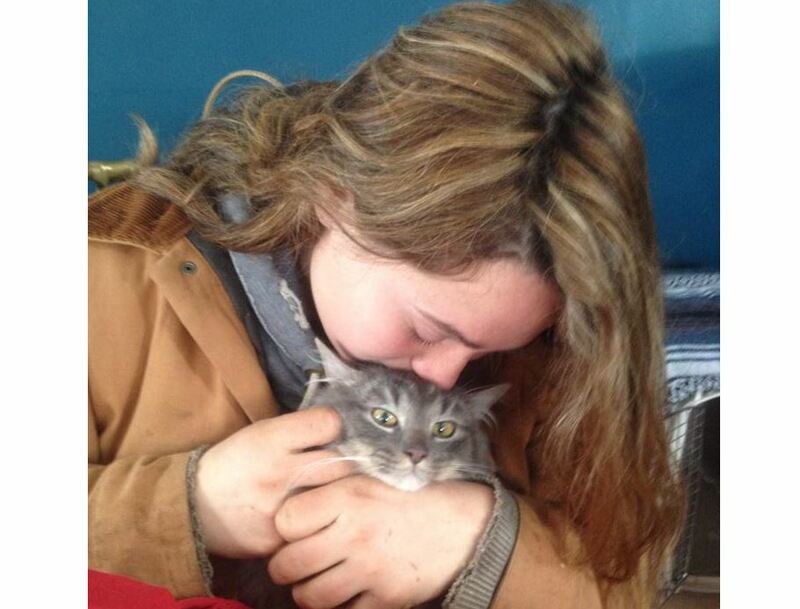 The publicity helped kitty’s family find him and bring him home. A relative saw the story on the news and contacted the family, who’d been looking for the kitty since he got out of the house Thursday morning and disappeared. The family has only had kitty for about 6 weeks and think a child accidentally allowed the indoors-only pet to get out. Kitty had managed to travel more than two miles from home before getting trapped in the ice and snow. The grateful family left a gift basket on the porch at Little Brook Farm this morning. The kitty has been positively identified by his owners! A relative saw him on the news and called his family. They were able to text me his photo. Although they’re local, he did travel over two miles. They have only had him 6 wks. and believe their young son must’ve accidentally let him out. They will be keeping the appointment to have him neutered. NATIONAL NEWS PICKED UP THE STORY!! **The cat’s family has been found as a result of all the media attention. He IS strictly an indoor cat but they feel their young son may have accidentally let him out. Dr. Patterson evaluated him and found him to be in perfect health – no signs of neglect or stress from his ordeal. It had been snowing and RJ discovered this little guy only moments from being struck by a snow plow. Although this cat has a dramatic story which has gained national attention, he has a happy ending. Millions of cats are sitting in shelters with their own sad stories and most of them won’t have a happy ending. PLEASE consider adopting a cat from your local SPCA or rescue group and be its hero. Post by Little Brook Farm. how wonderful! I hope they got him microchipped at the vet!